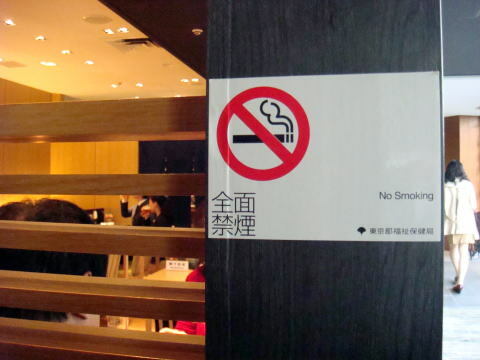 Many restaurants in Japan have a section of smoking and nonsmoking. in the same inner space with no wall or complete partition between two sections. Actually, this is meaningless, in view point of preventing an adverse toxic gas released from the tip of cigarette. (L) There is a total of 36 seats. Smoking seats are 26 and non-smoking seats are 10, at Cafe Pronto at the Tokyo International Airport ( Haneda) passage. (R) This cafe in the central Tokyo shows the seat information; it has 46 smoking seats and 14 non-smoking seats in this shop. No complete partition exists between two sections. (L) This cafe prohibits a photography taking, and cell-phone; however, it allows smoking inside. (M) A sign plate shows all seats are for smoking, and the firm does not provide the non-smoking seat. 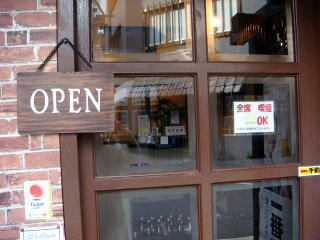 The writer observed that a family accompanied with children entered into this shop without any hesitation. Above-mentioned eating places are located in Shinjuku district, Tokyo. 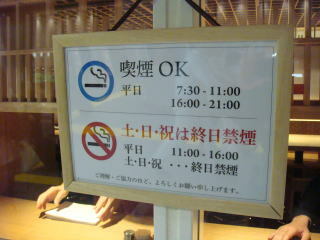 (L) Smoking is allowed in Becks coffee-shop at the basement of JR Shinjuku Station. 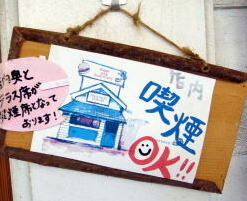 (M) This signboard says smoking is OK in the inner seats of Freshness-Burger shop. Almost all Freshness-Burger shops allow smoking inside of the shop. (R) All seats are smoking seat at Asakusa, Tokyo. (L) A restaurant cafe, 'First Kitchen' provides 42 non-smoking seats and 40 smoking seats in the same indoor space. 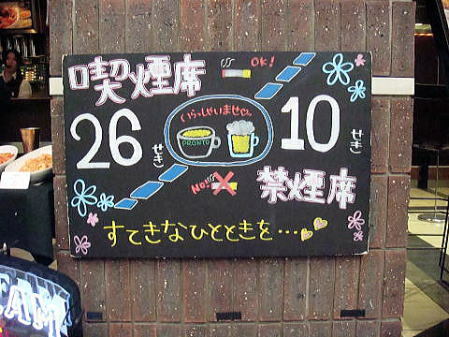 As other cafes, it displayed a lunchtime no-smoking hours. 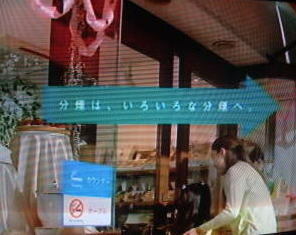 (M) This is a bakery shop which allows smoking inside. Smoking seats are 19; non-smoking 22. Both eating places are in the central Tokyo. department store, Tokyo. It looks separated from the other space; however, the space above the door is open. All tobacco-smoke is flowing out to a passage of the station. of the tobacco consumption in Asia, and is second only to China as Asia's largest consumer. widespread. 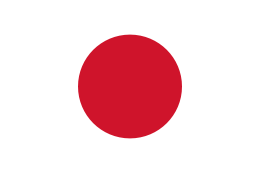 Statistics show Japanese men smoke at one of the highest rates in the world in 2002.
the lowest recorded figure since Japan Tobacco began surveying in 1965.
politicians and the Ministry of Finance itself has interests in income tax from tobacco sales. aimed to ban smoking inside restaurants and cafes. 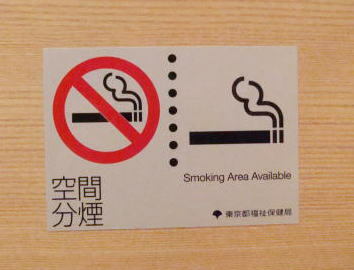 Kanagawa Prefectural ordinance, which is the first law to restrict smoking in a public place in Japan. were excluded from this law. buildings and railways, except for operating a smoking-car of JR Tokai's shinkansen super-express. facilities, however, were smoke-free now anyway. definitely against the purpose of the clean-air act: anti-smoking law. (L) Why this shop says 'sorry' for that all seats are non-smoking? It should state that we are proud of being smokefree in this restaurant. This photo was taken at Roppongi, Tokyo, in January 2013. 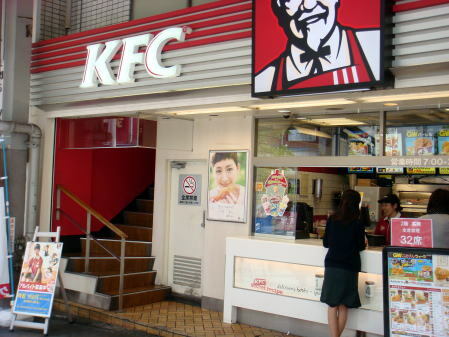 (R) This KFC shop in Shinjuku district became smokefree after the health-promotion law went into effect in 2003. 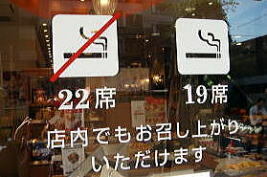 However, because of a marked decrease of customers, the shop did a 180-degree turn to allow smoking at all seats. complete partition existed between smokers' seats, a complaint continued. In 2012, it turned back to all smoke-free. (L) Salon de the Paul (R) A smoking booth is located not far away. You do not to need to worry much. 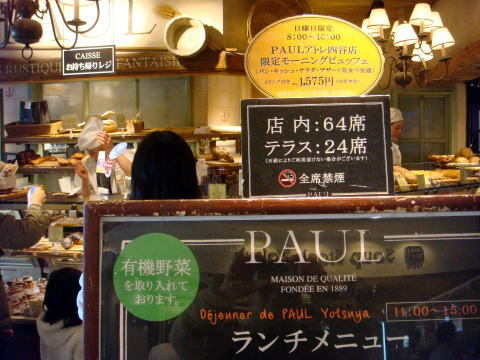 Paul's restaurant at Yotsuya, Tokyo is smokefree 64 inside seats and 24 terrace seats. Paul in Paris, which was established in 1889, has over one hundred shops in France. 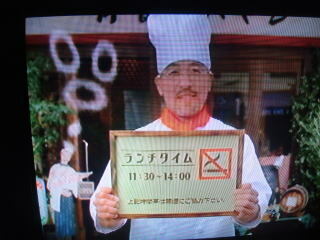 Now, many department stores in Tokyo provide a smokefree restaurant. However, a smoking booth is always nearby on the same floor. Unless it banns smoking in the entire building, a restaurant user may put the light on at all eating houses. (L) It is lucky to see this sign of a total smoking ban in a restaurant. exists between both chairs. This sign plate is posted under the name of Tokyo Metropolitan Government. The above pictures were taken in April 2013. 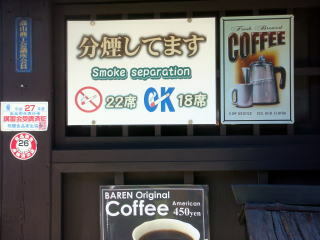 (R) This is a coffee shop which allows smoking inside. 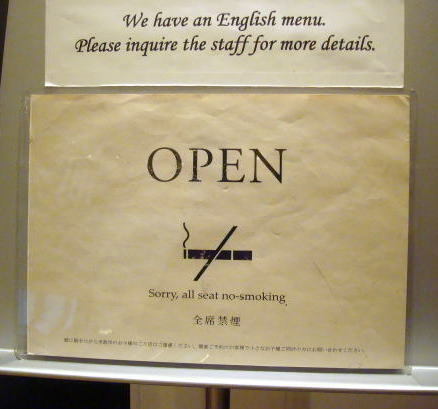 Smoking seats are 18; non-smoking 22.
in a restaurant facility in Japan. 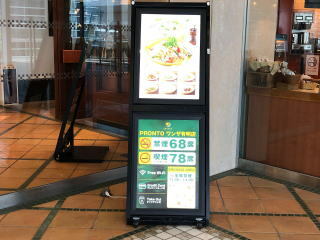 Pront coffee-shop in Odaiba shows the number of smoking seats is 78. In contrast, the non-smoking seat is 68. Many restaurants are similar, and some shows the lunch-time non-smoking and all smoking after that and in the evening time. Odaiba is a popular shopping and entertainment district on a man-made island in Tokyo Bay. How do you say that in Japanese, at the entrance to a restaurant? Can I put a light on cigarette here? If you get this kind of answer, you had better to leave that restaurant instantly. 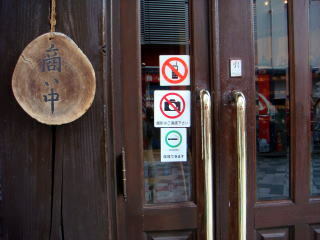 I advise you that if you cannot see the non-smoking sign over the entrance, you should avoid using that restaurant. 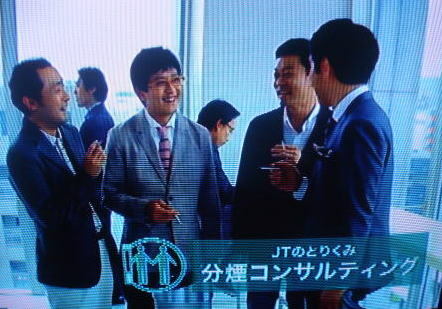 A tobacco company is trying to brainwash Japanese people. 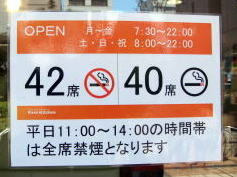 (L) No smoking during the lunch time ( 11:30-14:00) is very odd setup, only seen in Japan. I have never seen this kind ridiculous sign board in any part of the world. rush hour is inefficient. This is, absolutely, not from the point of health of customers or restaurant workers. (M) It appears to be adequate to separate the smoking and non-smoking seats on each floor of the building. at the floor level which allows smoking. (R) The sign board shows that smoking is allowed on the counter seats, but not on the table seats. This means all space of this restaurant is same to the smoking room, that does not protect a child's health. A mother should recognize the high risk of cigarette smoke in this restaurant. 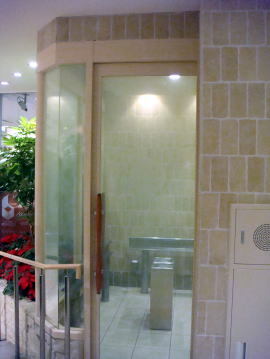 JT always opposes to the total smoking ban, and insists to provide a smoking-booth inside of a building. following moves to further combat passive smoking ahead of the 2020 Tokyo Olympics and Paralympics. restaurants and aims to submit to the Diet a bill to revise the Health Promotion Law to prevent secondhand smoke. the event on that day. 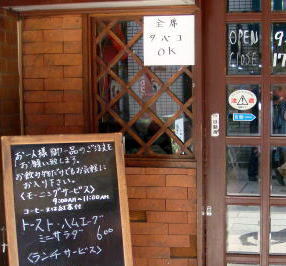 Olympic 2020: Japan has a serious health problem with the safety of restaurants. 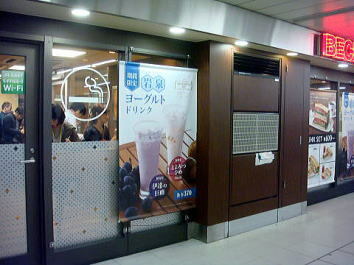 ・・・・Koike also assists to the financial support, making a smoking booth in restaurants. of the whole construction fee in 2013. 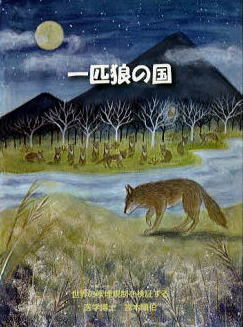 The article was written in January 2013, and last revised in November 2013, by Junhaku Miyamoto, M.D., PhD. 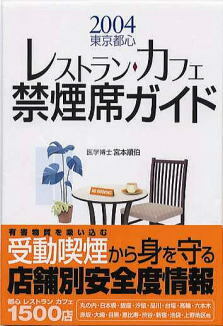 presented the individual on-the-spot survey of 1500 restaurants and cafes in the central part of Tokyo. This field work was conducted in 2003. This site was last revised in January 2017.